Free shipping. Buy direct from HP. 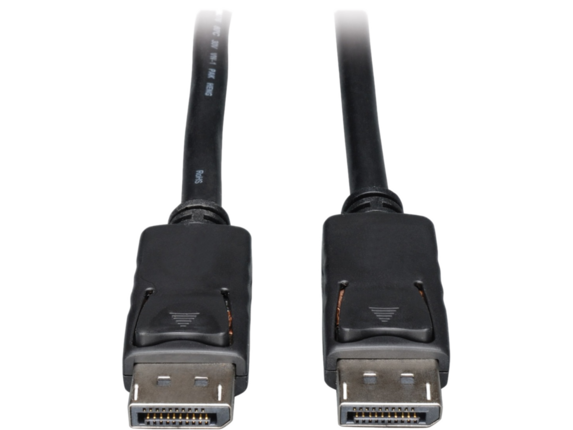 See customer reviews and comparisons for the Tripp Lite 1ft DisplayPort Cable with Latches Video / Audio DP 4K x 2K M/M. Upgrades and savings on select products. Tripp Lite 1ft DisplayPort Cable with Latches Video / Audio DP 4K x 2K M/M - DisplayPort for Monitor, Audio Device, Home Theater System - 1 ft - 1 x DisplayPort Male Digital Audio/Video - 1 x DisplayPort Male Digital Audio/Video - Black"
DisplayPort is a digital display interface standard put forth by the Video Electronics Standards Association (VESA). It defines a digital audio/video interconnect intended to be used between computer and display monitors, or computers and home theater systems. Similar to HDMI, in that it supports both Digital Video/Audio signals, DisplayPort is geared more toward the computer market, where HDMI dominates the Home Theater market. Tripp Lite's DisplayPort cables support a maximum bandwidth of 10.8Gbps, as well as DPCP ( DisplayPort Content Protection), and HDCP. Supports Ultra High Definition (UHD) 4Kx2K video resolutions up to 3840 x 2160.